Doodled Cats is packed with creative prompts, fun feline facts, and step-by-step doodling projects for the feline fanatic in you—the perfect book for on-the-go artists. 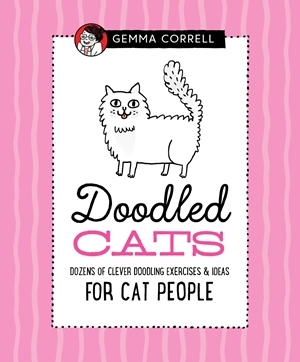 In Doodled Cats, beloved artist and illustrator Gemma Correll provides inspiration and ideas for doodling a variety of different cat breeds in a fun, quirky style. From a Persian and a Sphynx to a Scottish Fold and Siamese, doodle enthusiasts will learn to draw and doodle all their favorite feline friends, in addition to anthropomorphic cats, fashionable furballs, and even cats in hats! A bonus project demonstrates how to create your own cat-doodled mug. This compact, hardcover book makes the perfect gift for on-the-go creative types and cat lovers alike.